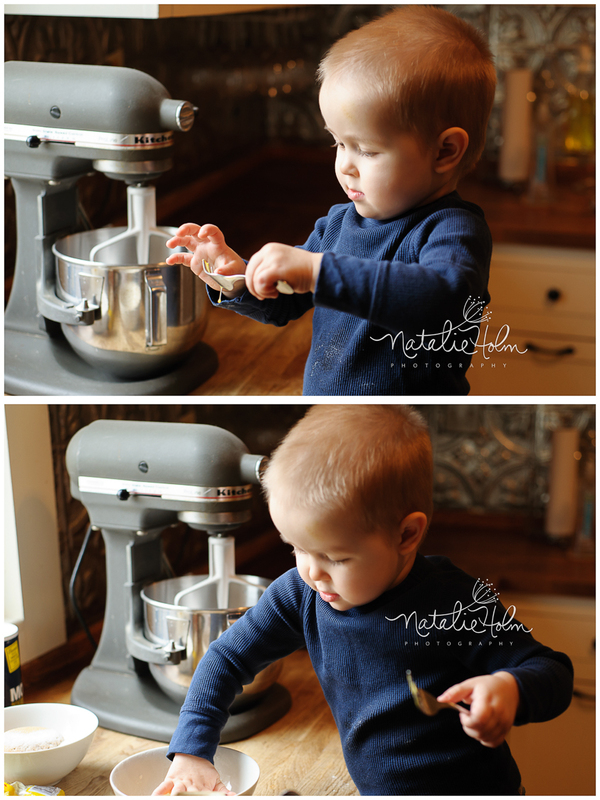 Last year around this time I tried to involve Jeremiah in a baking project. Though super cute, he was no help at all. It’s been a year since our last attempt (click here to see those photos!) and I’m happy to report that he did better! He was still absolutely no help, but that’s not why mama’s let their little kids “help” them in the kitchen, is it? He loved the eggs. He just kind of chanted “Eggs! Eggggggsss!” over and over. 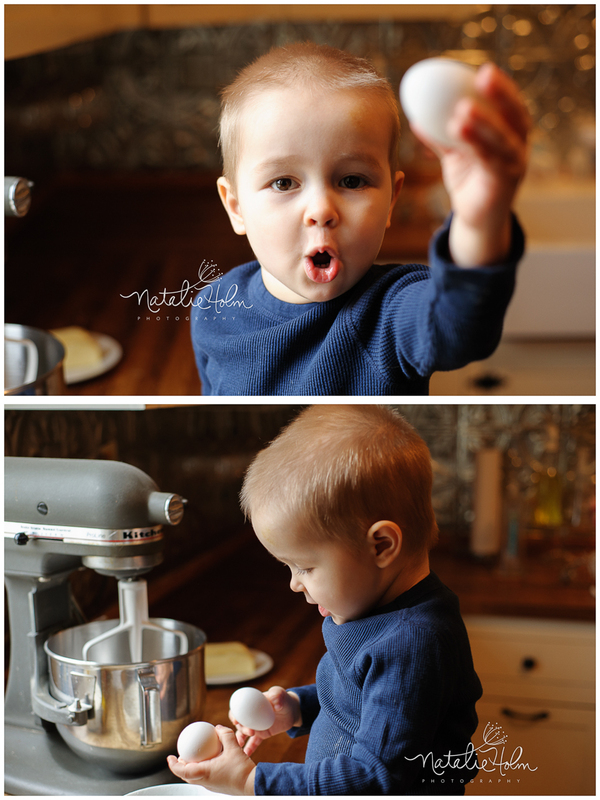 He wanted to hold the eggs before we cracked them and then *really* wanted to smash the yolk with his hand. It kept slipping away from him, though! 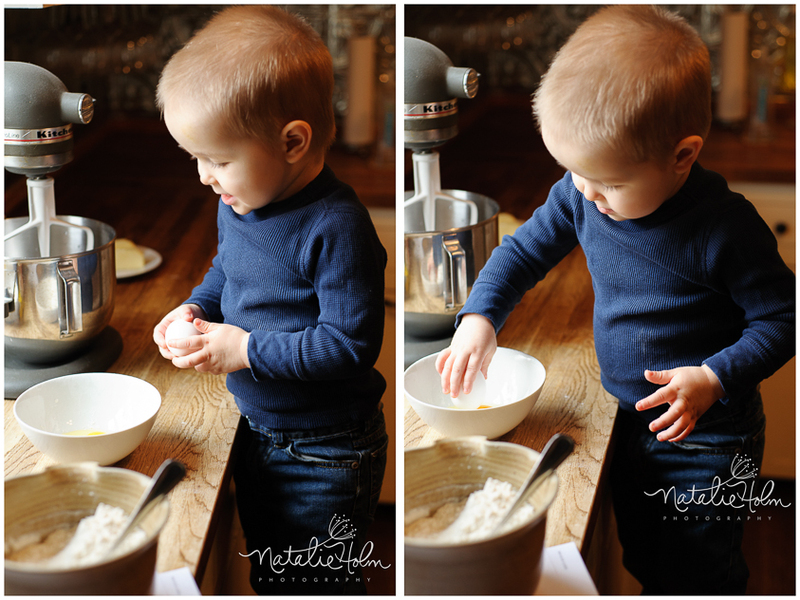 We also counted spoonfuls of flour as we added them to the mixer. He got all the way up to 19! I love this kid– he just makes my heart sing. Valentine’s Day is a great excuse to break out the construction paper, scissors, and ribbon and make some festive decorations. It’s also a great excuse to dress up your kids (or other people’s kids, as the case may be!) and put jars of candy in front of them to entice them to smile for the camera. More times than not, the candy actually proves to be a distraction (or a choking hazard, ahem…) but it’s fun nonetheless. And Oh-My-Word are these babies and kiddos cute! I am excited to share with you some photos I took back in the fall… when I was *super* pregnant and barely able to move. Now that the holidays are over, my baby is here, and I am finally settling in to somewhat of a routine, I thought I would catch up on some blogging. This family… oh my goodness how I love this family. They are so special to me and I just adore them. I know I’m not the only one that thinks so– the Simons family is adored by many! Back in the fall I had the opportunity to take their photos at the Rose Garden in Raleigh. The photos turned out great, which is totally what I expected considering how beautiful they all are! Not only did we get some great shots, but I also had great time with their family. I love you, Simons family! I love this family! Dawn and Eli are dear friends of mine and I was so happy to have the chance to take photos of their family. Lots of folks have watched over the last three years as Dawn and Eli adopted Esther, Josie, and Mzee– they’ve ridden the adoption roller coaster three separate times with grace, faith, and love. They’re down-to-earth, beautiful, authentic people who I just love being around. To say that I admire and respect them would be an understatement. And oh my goodness, are their kids cute! Esther and Josie crack me up– How can such big personalities live in such little bodies? And Mzee with that smile! It can be a little shy or outright goofy. What a blessing it is to see this family together. Adoption is a beautiful, beautiful thing, don’t you think? Having your photos taken can be a stressful experience, especially if you’re not sure what to expect or feel unprepared. One of the questions I get asked by most everyone is, “What should we wear for our photos?” In an effort to consolidate information, I thought I would put together a list of things I’ve found to be helpful. Your face should the lightest part of the image. Our eyes are drawn to the brightest part of the photo, and we want that to be your face! Try and stay away from wearing white, cream, and pastels. Avoid graphics, text, and large prints. In addition to being distracting, they tend to look dated after a few years. Dress for comfort as well as style. If a particular article of clothing only looks flattering from a certain angle, then avoid wearing that for a photo shoot. You’re going to be standing, sitting, kneeling, etc, so it’s best to wear something that you feel comfortable in that also makes you feel beautiful. Don’t forget your accessories! Things like scarves, blazers, hats, etc, can really make photos fun!